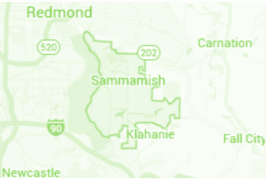 Learn about real estate, schools and attractions in Sammamish, Washington! Bordered by the breathtaking Lake Sammamish to the west and the lush Snoqualmie Valley terrain to the east, the city of Sammamish is an ideal location for a true Pacific Northwest enthusiast to call home. Located on the Plateau, the city is home to two of the most beautiful lakes in the area. Small and private, Pine Lake and Beaver lake offer beaches for swimming and desirable homes with a lake front view. Sammamish is home to nine parks and one major trail system making it appealing to individuals and families who enjoy spending time making memories outside, or the exercise enthusiast who prefers to enjoy nature at its finest while getting their workout in. This beautiful city nestled into the greenery of the plateau also offers shopping villages for quick with access to everything from groceries and drug stores to specialty gifts and wellness spas. Fun fact! Did you know that Clint Eastwood used to be a lifeguard teacher at Beaver Lake Park! The city of Sammamish is host to schools that are part of the two highest rated Issaquah School District, and the Lake Washington School District. As part of two top rated districts, the schools in Sammamish come with a high rating and are desirable for families looking to move into the area. There are 11 elementary schools in Sammamish including private, public and montessori, 4 middle schools, and 3 high schools serving the community. Lake Sammamish, is the largest lake in the area stretching 7 miles long and 1.5 miles wide. Accessible from private docks, community beaches and a state park, this pristine lake offers a plethora of activities for the outdoorsman, or anyone enjoys the lake’s natural beauty. Whether it’s fishing, boating, floating, training for a triathalon or relaxing on the shore, you can find it at the lake. Beaver Lake, a 79 acre gem on the Sammamish Plateau is closed off to boats with gasoline motors. This lake is one of the most popular fishing spots for Sammamish residents. The houses lining this majestic lake are ideal for sitting out on the dock and doing a little fishing. The lake is home to Trout, Bass and Perch, so put in your line, kick back and wait for dinner to come to you. The lake also has a beautiful public park complete with a covered party space and tons of walking trails. Pine Lake is surrounded by a wooded park offering swimming, a boat launch, fishing piers, two play areas, baseball open field and a basketball court. The public park has plentiful picnic facilities and is host to numerous community events. The park is conveniently located i the heart of Sammamish and is open from 6 am-dusk in the summer months, and 7 am-dusk in the fall/winter. Pine Lake Park is ideal for families looking to spend a day enjoying the water, and exploring the grounds. Conveniently located in the heart of the Sammamish Plateau and only 1 mile away from the Pine Lake Park, Pine Lake Shopping Center has you covered for all of your shopping needs. The center is home to QFC, Mail Post, Rite Aid, and a few major banks to make your Saturday errands a breeze. After your errands, grab a quick drink at Starbucks before browsing the specialty shops gift shops and clothing boutiques. Pine Lake Pizzeria or La Casita are top choice eateries for hungry shoppers and families spending the day exploring the Sammamish Plateau. A short walk from many of the most desired neighborhoods in the Sammamish area, the Sammamish Highlands offers local amenities, dining, and recreation activities. Saturday morning shoppers can be found exploring the aisles of Trader Joe’s, picking up dog food at Petco, and grabbing a beer with friends at the Ale House. This 3 mile shopping center is ideal for residents and visitors. Exclusive to members and residents of the Sammamish Plateau, the Plateau club features a breathtaking 18 hole golf course, a beautiful clubhouse with true northwest style, and a full-service recreation center. The family-focused environment of the club is rare and caters to the distinct needs of the members and their families. The Plateau Club hosts many events throughout the seasons including Family Night, Steakhouse Night, golf lessons, swimming lessons, day camps golf events, junior golf programs and many more. Considering stopping by for a tour and a bite to eat while you discover everything that this property has to offer. One of the most desired golf locations in the city of Sammamish, the Sahalee Country Club encapsules the true beauty of the Pacific Northwest. This all weather, year round course is lined with trees along its narrow fairways. The club hosts three 9-hole courses (the North, the South and the East) making it easy to play a quick morning game, or combine two courses for a longer afternoon game of 18 holes. To ensure the enjoyment of all of the clubs guests the property has a strict dress code and a cell phone policy listed on their website. The Sahalee Country Club has hosted numerous professional golf competitions including the 98’ PGA Championship, the NEC World Golf Championship in 2002, and the USGA Senior Open in 2010. The club, will excitedly open its doors again in 2016 to host the KPMG Women’s PGA Championship.